Every society reaches a point where it must examine its principles and choose whether to recommit to them or toss 'em out for new ones. 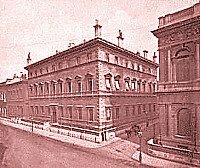 Although in 2006 it gets clearer every day that Western Civilization has reached that point, the question of the Crisis of the West was brought into exquisite focus nearly 100 years ago by a group of British gentlemen who called themselves The Reform Club. Current events are a likely starting point, because we share some commonality with the particulars. But for us to seek genuine understanding, they must only be a starting point. To duplicate the babble (perhaps the most deeply rooted etymology in the English language: the Tower of Babel, where no one is intelligible to the other) that passes for intelligent discussion elsewhere and everywhere is insufficient to the purpose of this blog, which like that club of visionaries in the past century is dedicated to the search for foundational, not ephemeral, truths. Is Bush a power-mad jerk? Perhaps, but power-mad jerks are the vocabulary of politics, the price of doing business: they are far more common than uncommon. We shall not solve them permanently, and to rail against this one or that one may contain truth, but it's only a passing truth. Meet the new boss, same as the old boss. We are here for more than that. 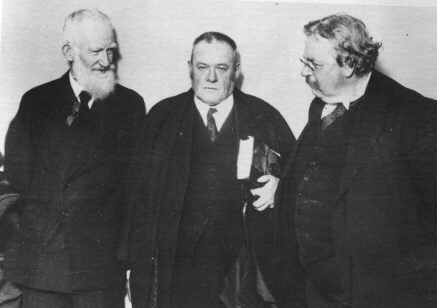 In 1928, the orthodox GK Chesterton debated his existential enemy, the modernist George Bernard Shaw (with Hilaire Belloc as moderator), on how our society should order itself economically. It took me half an hour to relocate the transcript, which can be found here. I beg as a courtesy, or even a favor, that contributors and commenters alike gain some familiarity with it. The discussion was playfully and wisely entitled "Do We Agree?" To understand what they were after, the presentation of unique and foundational views peppered with not a little bit of wit so that the proceedings are not just substantive but downright fun, is to understand our aspirations for this blog. We can create a great and nourishing thing here at The Reform Club, but it will require the cooperation, precision of argument, and good will of all to make this forum special. One concession Shaw made to orthodoxy and classicism is that we must leave our rhetorical barbarism at the door. Civility is essential, but is the merest of requirements to get where we can go. To parrot the prevailing arguments elsewhere serves no purpose either: it is a waste of time and cyberink (yes, the latter can be wasted because it consumes the former). We must do our homework on what's already being said elsewhere (especially on the side opposite our own), beginning with an understanding of Square One so we can move together toward Square Two. We have to get somewhere if we're to get anywhere. Square Two (in the least) is our goal, if The Reform Club is to be more than a pale copy of the rest of the internet. Quality over quantity, inquiry over debate, original voices over echo chambers. The Reform Club, rhetorically at least, recommits itself to its principles, and this is non-negotiable. We will not and cannot gear ourselves to the lowest common denominator. It's for others to preach to the masses; like the original Reform Club, we shall preach to those who themselves preach to the masses and hope we can send them away armed not so much with answers, but with the proper fundamental questions that must be asked again and again. Well-spoken, or rather, written. I'm printing out the debate as I type this. Many thanks. Definitely a good example of how to argue strongly and winsomely at the same time. That's the sort of thing I'd like to see. A little fun. A little education. A bit of jousting. Winsomely - what a great word. Let's be winsome - even if sometimes it's only for our own edification. Thank you for the link, Tom. I confess to not being very familiar with the three gentlemen in question, but the debate is quite enlightening.